Brazilian slate is highly attractive and available in three beautiful colours: a deep charcoal, mid grey with a green hue and multicolours. 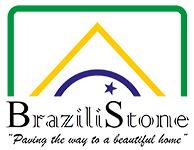 At Brazilistone you can order a wide range of slate tiles and wall cladding, including stunning multicoloured strips that can bring a magical look to variety of rooms. Slate cladding has become extremely popular over the past few years, with more and more people wanting to bring natural stone into their home and garden. Since all cladding and tiles have their own shape and shading, this type of material will bring a unique look to your garden. Our products including our Strip Wall Cladding, which offers a gorgeous contemporary look, perfect for adding a feature wall to a modern property. Suitable for indoor or outdoor use, it will be able to withstand even the worst British weather. Slate is naturally hard-wearing which makes it ideal for outdoor projects. Popular uses for our slate wall cladding include fire places, wet rooms and external walls; it is also ideal for kitchens, bathrooms, splashbacks and much more. Our products include multicoloured strips which start from £18.65 and have beautiful colour variations, with a wealth of different tones. Dazzlingly iridescent, this type of slate is truly striking and can bring any room to life.